I love spring! However, some of my favorite winter commute companions will soon be departing. Our Salish Sea feathered friends are turning their focus from sitting out the winter in our relatively calm and rich inland waters to getting busy on this summer’s crop of young’uns. 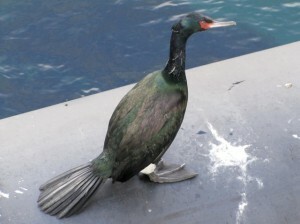 For many birds, that means leaving central Puget Sound for points north or inland. Many are changing dramatically into their winter plumage (the flashy reds, blues and whites of grebes and cormorants are some of my favorites). 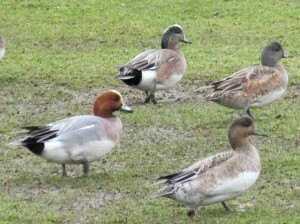 The winter birds of which I am most fond, however, are the wigeon. Many nearshore homeowners may disagree with my attraction to wigeon. Wigeon love short green grass and can poop, stomp and nibble a manicured lawn all winter long. I’ve seen flashy objects in some shoreline lawns that I imagine are intended to keep wigeon off (if you have experience with this, I’m curious how well it works). A large flock of wigeon typically affords an ornithological treat. Actually, it’s more like a treasure hunt. When you find the treasure, you get the treat. Like a needle in a duck down pillow, a male Eurasian wigeon (rust colored head) can often be found among the hundreds of American wigeon (speckled head with a green stripe) in a large flock. This winter guest to our shores typically breeds in northern Europe and Asia. Then flies far to the south to enjoy more temperate winters. Those that we see just happen to migrate down through Alaska instead of Siberia. 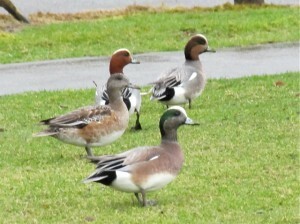 In mid-March, the flock of wigeon at Evergreen Park in Bremerton made it a little easier to find the needle. At least 4 handsome, brown headed lads were pulling up grass with gusto. If you wish to see them, you might head down to Evergreen Park to scan the flock and wish them well on their long flight to the breeding grounds. However, it’s possible that some Eurasian wigeon temporarily defect to North America. There’s some debate among birders that a few wigeon ladies might find themselves swooning for the fancy feathers of a male from the other species, resulting in hybrids that share some characteristics of each. There also appears to be some variability in each species that may lead to the speculation of hybridization. Wherever they go, these large flocks will soon depart, and I’ll just have to look forward to September when the wonderful wigeon return. In the meantime, my arguably less charismatic commuting companions of summer are just around the corner… Go big jellies! Jeff Adams is a Washington Sea Grant Marine Water Quality Specialist, affiliated with the University of Washington’s College of the Environment, and based in Bremerton. You can follow his Sea Life blog, SalishSeaLife Twitter, email to jaws@uw.edu or call at 360-337-4619.